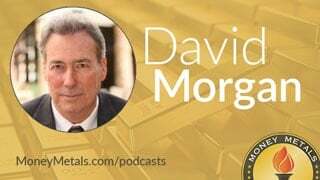 Coming up David Morgan of The Morgan Report joins me for a replay of one of the very best interviews we did in 2017. David talks about the metals and the markets and shares his insights on what the smart money is already doing, the dangers of complacency and the importance of limiting counter party risk. Back by popular demand, don’t miss this wonderful interview with the Silver Guru, David Morgan, coming up after this week’s market update. As markets close out their final trading day of 2017, it’s a good time to review the year that was in precious metals and look forward to the year that might be in 2018. Even though gold and silver markets spent most of 2017 mired in unremarkable trading ranges, they are each managing to post decent gains for the year. Of course, those gains are being overshadowed by the relentless push higher in the stock market and the explosive spike in digital crypto-currencies. Overheated markets can stay overheated for some time. But the longer they go without shaking out leveraged speculators and late comers, the greater the risk of an eventual crash. The stock market will enter 2018 with record levels of margin debt and cyclically adjusted valuations at their highest since the 2000 bubble. By contrast, gold and silver markets will enter the New Year with open interest on the futures exchanges at relatively low levels and retail bullion demand also on the low side. The hot money isn’t betting on metals – at least not at this point in time. From a contrarian perspective, that suggests the precious metals space has lots of room to run on the upside after it finds the catalyst it needs to spark renewed investor interest. Turning to this week’s market action, gold prices are up 2.2% since last Friday’s to come in at $1,303 an ounce. The yellow metal will finish 2017 close to 13% higher for the year. Gold outperformed silver again this year. The white metal is now up about 6% for 2017 after rising 3.2% this week to bring spot prices to $16.98 per ounce as of this Friday morning recording. The best and worst performing precious metals of 2017 are palladium and platinum, respectively. Palladium prices surged more than 55% this year and currently come in at $1,059. Upside momentum could take palladium to new all-time highs in the first few trading days of 2018. If the momentum is with palladium, then the value may be with its sister metal platinum. Platinum finds itself in the extremely rare position of trading at a discount to BOTH palladium and gold. Platinum prices currently check in at $936 per ounce, higher by 1.7% for the week and 3.5% for the year. So which metals will perform the best in 2018? It depends largely on whether the economic growth story has legs. If the economy heats up due to tax and regulatory reform, then industrial metals including copper and perhaps silver as well could see impressive gains. If the economy falters and the stock market rolls over, then the safe-haven metal of gold will be the place to be. Of course, we recommend keeping both gold and silver bullion as core holdings. But we do see more long-term upside potential in silver at these levels. By long-term, we’re looking further out than just the next 12 months. The silver to gold ratio has been depressed for the past few years. We expect a strong move in favor of silver to put the ratio back at more historically normal levels, a ratio which currently stands at a whopping 76.7 to 1. We can’t guarantee the big move in silver will happen next year. But as long as the silver-to-gold ratio remains relatively depressed, it’s a relatively favorable time for long-term investors to be accumulating silver. There is a very real chance that inflation could reemerge as a concern for investors in the coming year. Inflation – at least as it’s reported officially – has been nearly dormant for the past few years. In 2018, the combination of higher economic growth and higher federal deficits could reawaken inflationary fears. Yes, the Federal Reserve stands ready to raise interest rates a few more times, or so they say. Precious metals naysayers will cite that as a reason why the U.S. dollar should gain versus other currencies. For now, though, monetary policy is taking a back seat to fiscal policy. The tax cutting, de-regulating, spending, and borrowing policies of the Trump White House have the potential to be highly stimulative. Big on Donald Trump’s agenda in 2018 will be a push for new infrastructure spending. Infrastructure programs would directly stimulate the real economy and boost demand for raw materials. An uptick in inflation in 2018 may well be in the cards. It may even be the catalyst that drives investors back into precious metals in big numbers. Before we move on, I want to thank each and every one of you for tuning into the Money Metals podcast this year, and we hope 2018 brings you financial prosperity, good health, and happiness. For our part, we’ll be there again for you in 2018 – providing more great interviews and news content, plus top-notch service as we work to meet ALL your needs in the precious metals markets. Now let’s get right to our Money Metals exclusive interview. Mike Gleason: As an aside, we have been seeing a big uptake in the Bitcoin orders that we have been taking on our website MoneyMetals.com, we have accepted bitcoin for a good two years now and it's really starting to actually move the needle, believe it or not. David Morgan: Yeah, just go to the main website, TheMorganReport.com. If you're already on the email list, you can go ahead and download that for free. The system is smart enough to know if we already have your email. And then if you're interested in the book, just pull down the books tab on the website, you can order either book, The Silver Manifesto or Second Chance. And Mike I appreciate you mentioning that for me. Mike Gleason: Well, outstanding insights as usual David, it's wonderful stuff to hear and we're very grateful for your time and for giving us your thoughts on these important matters. We appreciate talking to you today and look forward to catching up with you before long. Take care my friend. Mike Gleason: Well, that will do it for this week. Thanks again to David Morgan, publisher of The Morgan Report. To follow David just visit TheMorganReport.com. We urge everyone at the very least to go ahead and sign up for the free e-mail list and start getting some of his commentary on a regular basis. And if you haven't already, check out The Silver Manifesto and his new book, co-written with our mutual friend David Smith, titled Second Chance: How to Make and Keep Big Money During the Coming Gold and Silver Shock Wave. Both of which are available on MoneyMetals.com and other places where books are sold. Be sure to check those out. And don't forget to check back here next Friday for our first Market Wrap Podcast of 2018. Until then, this have been Mike Gleason with Money Metals Exchange, thanks for listening and have a great weekend, and Happy New Year everyone.